Looking for the perfect place to escape reality? Ponderosa is a cozy cabin with a fireplace, wood floors throughout, and new furnishings. This beautiful Wallowa Lake cabin has an open floor plan with one large room which combines a kitchen and living room. The living area is an intimate place where the family can relax on the leather couches. Off of the great room are two bedrooms and one & 1/2 bathrooms. The cabin has a large, covered deck that looks out onto our open lawn with picnic tables. 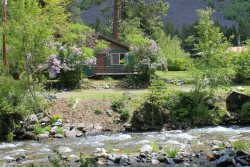 It is close to the lake, Wallowa Lake Tram, and various other activities that are great for the whole family!